This statement was written by Hooke as an anagram, and only solved and translated after his death. 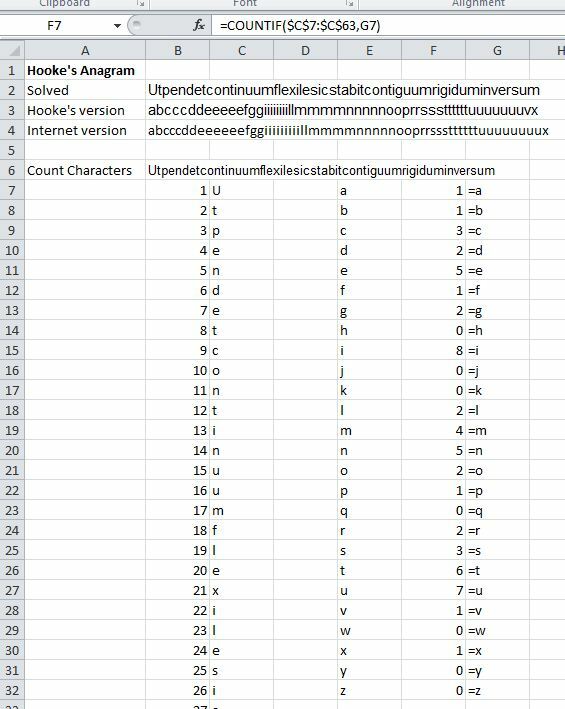 I noted at the end that the anagram had been miscopied at some stage, with the insertion of an extra “e”, and the miscopied version seemed to have been accepted as correct, even at a site with an image of the original version. Searching on Hooke’s version gets just 3 hits, two to this site, and one to a rather strange site who have copied my words exactly, other than changing “I” to “we” in a couple of places. This entry was posted in Arch structures, Newton and tagged anagram, arches, Hooke, plagiarism. Bookmark the permalink. Hooke was treated as a servant by the RS and the secretary was in Newton’s Pocket. Newton was never prepared to acknowledge any contribution from Hooke (though Hooke was probably a pretty hard man to get along with anyway). Thew anagram was his way of claiming precedence. Done because if he had submitted a paper, he had good reason to suppose that the secretary would send it to Newton. Newton would rewrite it in his own words and the ideas would be published as his. Newton and Wren were at the forefront of structural engineering in the UK at the time and they needed the arch stuff to allow proper design of all the churches they were rebuilding in London. pendet is future tense. The present tense would be pendit, and that would be correct (and would match the English translation you give). v is often rendered as u in Latin. Hi Henry, thanks for your interest. There are 8 u’s and no v’s, so I think you are right about inuersum. But there are 5 e’s and 8 i’s, which is consistent with Ut pendet. The “standard” version has 6 e’s and 9 i’s, so that wouldn’t be consistent with either pendet or pendit.